This is the dish I made to serve alongside the ratatouille on Sunday night. I like to think of it now as the dish that could have killed my reputation, at least on Twitter, as a cook. Let me explain. The first time I ever had ratatouille also happened to be the first time I had polenta. My beloved high school drama teacher had a daughter a few years older than me who really liked to cook. One summer, newly vegetarian and home from college, they had me over for dinner. They made me the ratatouille from the Moosewood cookbook and served it on top of a bed of polenta. Truthfully, I was nervous. I was maybe 19 and although I had always loved food, my palate was not what I would call overly sophisitcated. But I loved that simple stew and I fell head over heels for the polenta. Ever since, if I make ratatouille, I make polenta. With Matt and family coming over, I wanted to make a little fancier riff but still keep it a Sunday night dinner. In the Plenty cookbook, I found this idea. This polenta is cooked with rosemary, butter, and Parmesan, and then poured out onto a sheet to cool and solidify. Some mushrooms that are sauteed in olive oil and then tossed with garlic and herbs. Taleggio cheese is carefully place over the top and the whole thing put in an oven warm enough to melt the cheese. I bought my mushrooms, as I did almost everything for this meal, at the farmers market. We are in prime mushroom season right now in the Northwest. The chanterelles were $8 an pound and I splurged on a few porcinis as well. I washed all the pine needles out of them and allowed them to dry, sauteed them as directed. The few bites I stole told me that even without the polenta, this was going to be a great dish. My polenta didn’t solidify as much as I wanted but the taleggio melted just as it should and the mushrooms were definitely the star. After everyone went home, I put the polenta in a container but ate the mushrooms off the top as I did the dishes. At 3am I woke up with a cramped stomach. I did not go back to sleep that night. I never felt terrible but I did not feel good. My stomach tends to be pretty hard to upset – it is only very rich food or frivolous amounts of olive oil that make me feel sick. Consequently, because I cook pretty clean, I have almost never felt ill from something I have made. I knew it had to be the mushrooms because everything else I made was pretty healthy – I even used a lighter hand than advised on the cheese. In other words, I was very concerned that I had poisoned my guests. Is it not bad enough to feel the pressure to cook for a food blogger that you respect, but then you have to go and poison him and his wife? By the time my boys woke up and I had made it about halfway through a novel, I was feeling better. I sent a tentative email to Matt. Were they feeling all right? I was just a teensy weensy bit concerened about the mushrooms. A tense hour went by in which I envisioned hospital visits and my reputation slaughtered, not to mention a budding friendship between three year old boys squashed. But no, all was well in their house. Phew! So as it stands, my two worst cooking gaffes are the African peanut stew I made for a friend who is allergic to peanuts (I didn’t know!) and the frittata I served to a couple who came for brunch and who don’t eat eggs (I didn’t know! And wouldn’t you mention that you don’t eat eggs if you are invited for brunch?) What is your greatest cooking faux pas? Come on – make me feel better. Providing you don’t buy poisonous mushrooms, this is really a great dish. Polenta is one of those things that can be hard to serve to guests. If you are going to go the soft route, it really needs to be made just before serving (unless you want to cook it in a double boiler). But if you make it this way, it can sit until you need it and it will still be hot from its trip to the cheese melting oven. The recipe instructs you to add truffle oil to the pre-formed polenta but I was out so I left it out. I opted to pour my polenta out free-form on a sheet of parchment paper for a more rustic look, but you can also pour it into a oven-proof pan sprayed with a little non-stick spray. Heat half the oil in a large frying pan over medium-high heat. Once hot, add half the mushrooms and fry until they are cooked through and brown in spots, about 8 minutes. Try not to move them around too much. Remove from the pan, add the other half of the oil and repeat with the rest of the mushrooms. Off the heat, return all the mushrooms to the pan and add the garlic, tarragon, thyme and a large pinch of salt and a few grinds of pepper. Line a medium-sized baking sheet with parchment paper. Bring the water to a boil in a large saucepan. Add the salt, then vigorously whisk in the cornmeal. Bring it back to a boil, stirring all the while, then reduce the heat as low as it will go. Cover the pan. Stir every 5 minutes or so until the polenta is smooth, about 20 minutes all together. Add the butter, Parmesan cheese, rosemary, a good pinch of salt, and a few grinds of pepper. Spread the polenta over the parchment paper and allow it to cool and firm up, at least 30 minutes. Preheat oven to 425ºF. Top the polenta with Taleggio and place in the oven until the cheese is melted and starting to bubble, about 5 minutes. 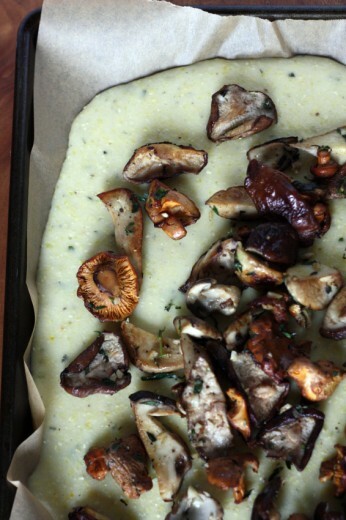 Remove and top with the mushrooms then return to the oven just warm for a minute or two. Actually mine was at my project food blog dinner party. I asked for allergies from people and a couple didn’t tell me because they didn’t think I would include those things in my cooking. Luckily I was all fancy in describing dishes so they caught them but I could have had 3 out of my 9 guests having reactions that night! Luckily I knew of allergies that two other guests had but seriously tell your hostess!!!!!! I’ve had so many cooking gaffes, starting with the pot of adobo that was perfectly cooked, but instead of lowering the heat I ended up putting it to high, having it smoking, and having the guests (who came for adobo) fanning the smoke alarm while I make a new batch of adobo. Haha. I love that you put the polenta on parchment paper! I am going to have to try this. 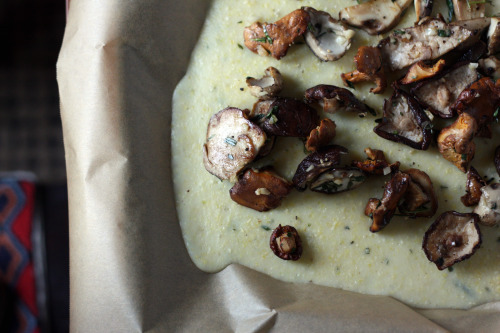 I hardly ever cook polenta at home, but your combo of this with the lovely mushrooms was delicious. As for cooking faux pas.. the first piece of fish I ever cooked was some Halibut, and I overcooked it to the point of ridiculousness.. It was beyond inedible. It was for an anniversary dinner for my parents in law..
we had a great time. and great food. Thanks for having us over! I finally grabbed a copy of Plenty and can’t wait to cook from it! 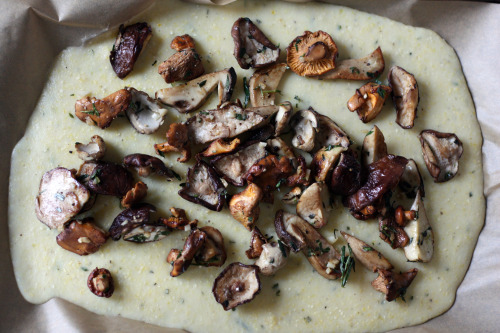 This polenta with mushrooms looks amazing. And, once again, I’m completely envious of the Northwest’s mushrooms. My biggest cooking faux pas might have been making a Creole shrimp dish several years ago when Kurt’s parents visited for the holidays. I didn’t know Kurt’s dad is allergic to shrimp! Oof. Worst cooking gaffe was putting fettuccine alfredo in a plastic container and then putting the whole thing on a still hot burner. Burnt plastic anyone? It was gross. And I swear I can still smell burnt plastic when I make fettuccine alfredo today. Which isn’t often. At least this is something you couldn’t possibly have helped! And the dish does sound seriously delicious. Polenta is the perfect vehicle for ratatouille. The 2 times I got ill from food was from mushrooms. Yes, my beloved funghi. Not because they were poisonous or bad, but because they are too rich for me and I can only eat one or two, sort of like lobster! I know that middle of the night feeling! I no longer indulge in mushrooms, except once in a blue moon. this is such a comforting dish. it looks incredibly delicious! This looks so good! I haven’t had enough people over to have any disasters yet. However, this Friday some people I just met will be coming over, so I’m crossing my fingers nothing goes wrong. A couple months ago I thought I poisoned Scott and myself. I was doubled over and spent most of the night near the bathroom, it was awful. I have no idea what did it, but I haven’t had brown rice with tofu and broccoli since! Oh my goodness! I can only imagine your anxiety after feeding friends and then feeling sick. Luckily, I have not had anything too bad go wrong (or maybe I’ve blocked it out :)) but I did make my brother a birthday cake and got the recipe from a trusted source. The cake looked fantastic, but people were trying to be nice and said they like the frosting or they liked the cake, but nobody seemed to like both. Disappointing! Oofta! I know that feeling! Same happened to me – and from mushrooms too! Thankfully I was the only one with tummy pains. Looks like some of us are more sensitive than others. But what an awful feeling to stress about making your guests ill! Totally yummy combo btw… and I WISH we had mushrooms like that here! What a story Dana! Glad you didn’t poison your guests ;) My worst cooking mishap also involves a frittata. I was just learning to cook & put a ridiculous amount of herbs into it and served to friends who were in town for a wedding. We ended up going for bagels before the wedding! Oh no! I’m sure it just didn’t agree with you…I’m glad you didn’t kill anyone and I’d still risk coming to your house for dinner! This looks amazing. I love how quick it is to prepare polenta. My first experience with it was at my aunt’s house – she also spread it out and then baked it in the oven to crispen up, then served it topped with sauteed green & red bellpeppers. Was delish. Wow that dish looks seriously amazing, everything about it sounds so good. Especially the polenta with the rosemary, butter and Parmesan.